“Techfor have completed an 8 panel solar PV installation for me. Their service has been excellent from start to finish. I particularly appreciated the good advice they gave me during the survey, making clear what could and could not be achieved and why, in contrast to some other companies who seemed willing to promise me almost anything.” John, Pangbourne. Are Solar PV panels environmentally friendly? Can a solar installation be installed on a roof that doesn't face due south? Do solar PV installations only work in sunny countries? Does the UK receive enough solar irradiance to make solar PV a viable technology? Do solar PV installations ever pay back their initial outlay? Can I reduce my electricity bill ? What happens during a power outage – can I still use my panels? How is energy generation affected by shading? Will adding a solar PV system increase the value of my property? With ever higher oil prices and European Gas supply outages in 2008, what is the global outlook for the security of our energy supply and solar energy? What organisations does Techfor Energy belong to? What consumer protection scheme does Techfor Energy belong to? Q: Are Solar PV panels environmentally friendly? A: Yes. Solar energy is environmentally friendly. Compared to fossil fuels which release greenhouses gases, carcinogens and carbon dioxide, solar cells don't release anything into the air. Solar energy is environmental friendly and conserves resources which effectively reduce emissions. No other energy can be as environmentally friendly as solar energy. It is a natural resource therefore it does not pollute the air when being converted into electricity. Solar energy systems significantly contribute to a reduction in greenhouse gas emissions and therefore help in the fight against global warming and provide a clean and green environment for future generations. Q: Are there any grants or incentives available? A: All local authorities are required to produce a local plan in which they set up their proposals to reducing local energy and carbon emissions, however, the FIT replaces the Clear-Skies grant which paid a maximum one-off payment of £2,500 if several energy-saving and efficiency measures (costing several hundred pounds) were implemented. Techfor Energy will establish any applicable grants or incentives in the given area and situation of individual customers. Q: Can a solar installation be installed on a roof that doesn't face due south? A: Yes. 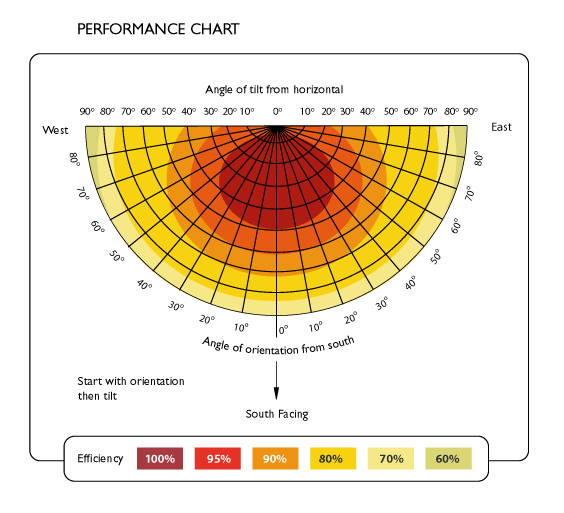 Roof mounted solar panels can be effective up to 90% of their rating, within 90 degrees of South when installed between 30-40 degrees from horizontal as shown below. We would not recommend installation on roof surfaces much greater than 90 degrees of due south. Q: Do solar PV installations only work in sunny countries? Q: Does the UK receive enough solar irradiance to make solar PV a viable technology? A: Yes. 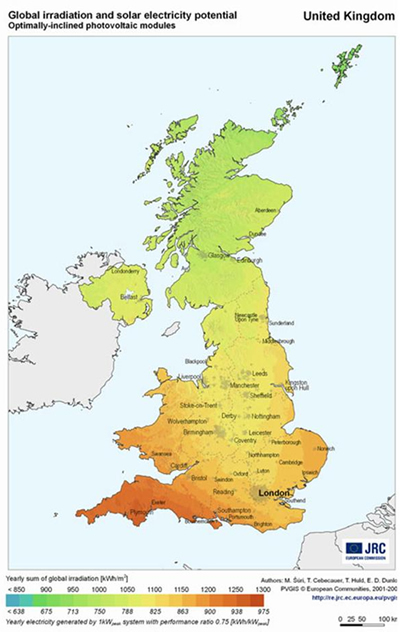 The chart below shows that the UK receives reliable yearly amounts of solar irradiance, based on decades of independent measurements from EU organizations and NASA. Manufacturer quoted production figures for the performance of solar products are based on Standard Test Conditions (STC) of solar irradiance of 1000 watts on a 1 meter squared horizontal surface at 25 degrees C with an air index (clarity) of 1.5. The chart below shows that 2/3 of the UK exceeds this amount, with much more being measured as the latitude progresses further south, assuming the PV panels are optimally angled to the sun. Q: Do solar PV installations ever pay back their initial outlay? A: Yes. With the introduction of the Feed In Tariff in April 2010, optimally designed and installed systems can pay back the initial outlay as quickly as 5 years for larger commercial systems and 7-8 years for residential 4 kWp systems, leaving 13 years of guaranteed, tax-free, index-linked payments of £ 900 or more per year. If energy prices rise then the payback time will happen even sooner and greater savings will be made. Ground based Tracker installations which track the movement of the sun throughout each day and throughout the year can increase power production by up to 45% and therefore increase FIT payments to approx £ 1,350 per year and reduce payback time to between 6 to 8 years depending on the specific installation. Q: Can I reduce my electricity bill? A: Yes. By slighlt lifestyle changes, most of our larger residential customers have reduced their electricity bill by 50% and some of our commercial customers have been able to use up to 90% of the electricity generated. Q: What happens during a power outage – can I still use my panels? A: Yes, but only with an additional component to the standard installation. Otherwise with a standard grid-connection, when a grid supplied power outage occurs, the inverter will shut off the electricity supply from the DC panels, to enable engineers to fix the problem on the grid without the risk of an electric shock. This safety feature means that although your solar panels are still producing electricity during the day, you are unable to access the power without an additional option fitted to your PV system. With optional technology fitted, you will still be able to access the power from your panels during a grid power outage and stored energy into the night. Q: How is energy generation affected by shading? A: Energy output is reduced if part of the installation is shaded. Effective system design and shading analysis can minimize the extent to which production is reduced. It is better to avoid shading if possible. Recent inverter technology advances allow for installations to manage shade in new ways which previously would have made an installation not viable. Where the majority of the proposed installation is shaded, during a significant portion of the day, an alternate solution such as ground-based installation or an alternate roof is advisable. We always offer extensive shading analysis and we build 3d models of the property on our computer systems to simulate accurate shading losses which we take off the annual energy prediction figures. This way our energy predictions and financial returns are as accurate as current technology allows. Q: Will adding a solar PV system increase the value of my property? Q: With ever higher oil prices and European Gas supply outages in 2008, what is the global outlook for the security of our energy supply and solar energy? Q: Which organisations do Techfor Energy belong to? A: Techfor Energy is certified under the Government's Microgeneration Certification Scheme via NAPIT which allows our customers to be eligible for the Feed In Tariff. We are also members of the NAPIT Competent Person's Scheme which allows us to self-certify Part P applicable building regulation work to Building Control. Q: What consumer protection scheme does Techfor Energy belong to? A: We are members of the REAL Assurance Scheme and therefore adhere to the REAL Consumer Code and follow the Consumer Guidelines to ensure our customers receive a high quality service and customer experience to accompany the best design & installation which meets their requirements. kWh	Kilowatt hour: This is the unit of electricity in which power consumption or production is measured. kWp	Kilowatt peak: This is the maximum rated output of a solar PV installation, measured under standard test conditions (STC). STC	Standard test conditions are a measurement of solar irradiation of 1000 watts per meter squared on a horizontal surface at 25 degrees C with an air index of 1.5. This is an industry standard measurement to enable product comparison and provide a baseline for calculations.